Today was just one of those days, you know? Glassy blue skies, that crisp November nip in the air. Despite the cold temperatures, I just couldn’t help but feel like it was going to be a special day. Maybe it was seeing the amazing Wrap Up London campaign finally take off. Maybe it was just the chance of a little sunshine. But whatever it was, I was feeling good. I was running ten minutes early. Even the crush of the London tube commute couldn’t dampen my spirits. Then, as I was coming out of the tube station, I slipped. Or at least, I thought I had slipped. But as I took another step and felt the cold pavement caress the bottom of my foot, the full, tragic extent of the situation dawned on me. 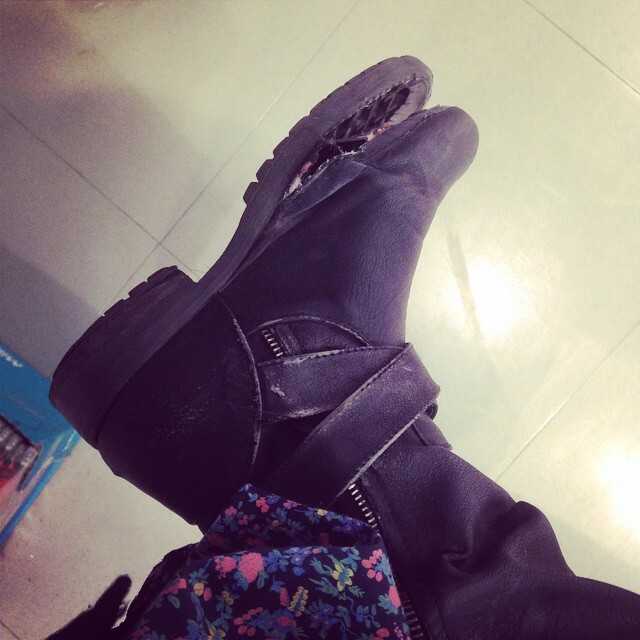 The sole of my shoe had come almost entirely detached from the boot itself, all the way back to the heel. I stood, commuters jostling around me, with one very chilly foot, and wondered what to do. Obviously, strolling into work like this just wouldn’t do. I limped over to the side of the pavement and sent off a quick email to my boss, explaining the situation. I waited with baited breath for an e-P45 to land in my inbox, but thankfully, it never arrived. Fortunately, this most unfortunate of events took place on Tottenham Court Road, a street completely lined with shops. I was confident I would have a new pair of shoes in no time. Considering the puddles on the ground, I decided it would be most prudent to keep my mangled shoe on. So off I set, walking like a drunk flamingo, half of my shoe flapping jauntily in the breeze, while surrounding tourists practically swallowed their own tonsils trying not to laugh. Do you know how many sofa shops there are on Tottenham Court Road? 16. How about sushi takeouts? 5. Take a guess at how many shoe shops there are. Not one goddamn one. I hit the Oxford Street Primark before I could find salvation. And had to negotiate two escalators to get to the shoe floor. It was like the worst episode of Gladiators ever. And with that, the magical feeling had gone.